DS Nancy Devlin has a secret. Although she's been awarded a medal for bravery for her work with the National Crime Division, she's spent her entire police career protecting Frank Le Saux, a somewhat shady businessman. 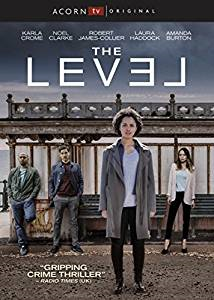 In the 6-part series The Level, Nancy, played by Karla Crome, has to walk a fine line between investigating crime while concealing her own unethical actions. When Frank calls and asks Nancy to meet him one night, bullets ring out from an unseen gunman, killing Frank and injuring Nancy. Because she must hide her ties to Frank, Nancy doesn't go to the hospital to treat her own bullet wound. 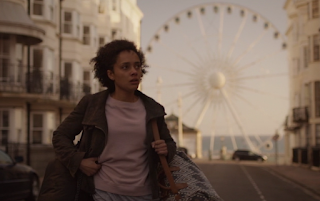 Things get even more complicated when Nancy is sent to Brighton to investigate the crime. Nancy grew up in Brighton, where her policeman father, Gil, was abusive to her mentally unstable mother. This has caused Nancy to become estranged from her father. Her mother has been hospitalized once again while her mental health issues are being treated and her medication adjusted. When Nancy was growing up, her best friend was Hayley Le Saux, Frank's daughter. Because of her unstable home life, Nancy spent a great deal of time with the Le Saux family and saw Frank as a surrogate father. This causes her, once she begins her career on the police force, to protect Frank whenever his name comes up in investigations. Nancy and Hayley lost touch years ago, when Hayley's unsavory boyfriend, Shay Nash, introduced her to drugs and Hayley was packed off to rehab by her parents. In the years since, Hayley has married a professional footballer and moved to Spain. When she returns to Brighton for her father's funeral with her two small children, Hayley reveals that she has split up with her husband and will be staying in England. Frank also has a son, Tate, who is living in a group home for mentally disabled adults. As Nancy begins investigating Frank's death, her boss DCI Michelle Newman assigns her to work with Gunner Martin. Not long afterward, her colleague and almost boyfriend, Kevin O'Dowd, is sent down from London to also help with the investigation. Not only must she attempt to hide her personal involvement with Frank, she must also investigate his death while her gunshot wound is causing her a lot of pain. The crime scene technicians soon discover a 5th bullet at the crime scene. This bullet is discovered to have DNA that doesn't match Frank's, so the police know there was a missing witness with Frank when he died. Frank owned a haulage company, and when he had his clandestine meeting with Nancy before his death, he mentioned that he was in trouble and also that he was working on a deal that was a "gold mine." Before long, Shay Nash contacts the police because he had a shipment on one of Le Saux's trucks that has gone missing. As the police attempt to trace the shipment, they realize that one of Frank's trucks is unaccounted for. Meanwhile, another thuggish Brighton businessman, Duncan Elliott, who owns Eagle Repairs has appeared on the scene. Elliott is very interested in purchasing Frank's business, and he's not a man you say no to . . .
Nancy certainly can be forgiven for playing fast and loose with the rules of professional behavior when she is allowed to get away with so much. With her superior Michelle Newman's knowledge (both before and after the fact) she commits several crimes that are brushed under the rug. Nancy grows suspicious of her colleagues when various pieces of evidence are unaccounted for during the investigation. It's a game of cat and mouse to try to figure out which of her fellow cops are "bent" and working with the criminal elements of Brighton. As the investigation continues, Nancy has reason to suspect almost everyone. Viewers who love British TV will recognize many famous faces in The Level. Although his appearance is brief, Philip Glenister makes an appearance as Frank Le Saux (although he does get rather a lot of screen time as a corpse!). Michelle Newman is played by the former Carol of EastEnders, Lindsey Coulson. Nancy's London colleague O'Dowd will be instantly recognizable as Robert James-Collier, whom many of us loved to hate as the wicked yet oddly endearing Barrow on Downton Abbey. It's great to see these fantastic actors appearing in new roles. 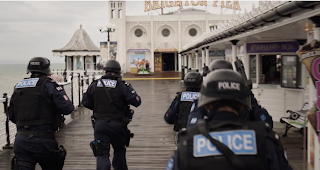 Beautiful beach side Brighton also adds atmosphere to the series and reinforces the idea that no matter how idyllic the location, bad things can still happen. The 2-disc set also includes bonus behind-the-scenes featurettes with the actors, writers and directors discussing how the series came into being, why people are fascinated with murder mysteries and even the quality of catering on the set! It's an interesting look at how much work goes on to create a series and how many people are involved that don't appear in front of the camera!